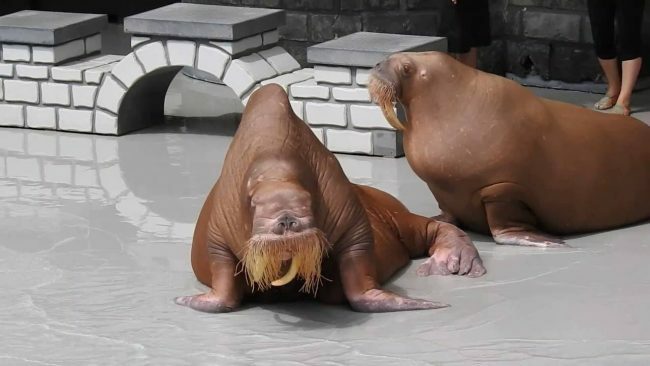 Zeus, one of the last remaining walruses who calls Marineland in Niagara Falls, Canada his home, has passed away. On Jan. 21, 2019 The Review Newspaper made inquiries to Marineland asking about the state of Zeus. The park announced that afternoon that Zeus died a month before on Dec. 26, 2018 suddenly of natural causes. Marineland issued a media release on Jan. 21 saying that Zeus was receiving full-time veterinary care prior to his death. He did not show any signs of issues or illness. The walrus had no difficulty eating and was at a healthy weight. Philip Demers who worked at Marineland for more than 10 years disagrees. He shared a video of Zeus from 2016, and this piqued the interest of PETA. Zeus was performing, and it showed his shoulder blades and hips protruding. He was also lethargic and weak. At the time, he was approximately 13 years old, and a healthy weight would have been 3,000 pounds. Zeus weighed about 1,000 pounds. Marineland responded by sharing photos of Zeus looking healthy. They also released a video showing the walrus eating fish. The park stated Demers is not an expert on walrus’ and knows nothing about their health. Demers claims he had a fight over Zeus’ health with John Holer, the former park owner who died in June 2018. He quit in 2012 over this issue. Demers went to the press about the alleged conditions of Marineland, which resulted in a $1.5 million against Demers for slander which is still in the courts. Marineland claims a necropsy was performed which showed Zeus died of heart failure due to old age. The autopsy was given to the Animal Care Committee. Demers stated Marineland only announces the death of animals at the park when people question them. He also said photos and videos of Zeus looking ill went viral over the years which documents his unhealthy weight. He thinks there are two walruses left at the park, Apollo and Smooshi. He is due back in court on Feb. 1. One Response to "Zeus the Walrus Dies at Controversal Marineland in Canada [Video]"
Hi, Neat post. There’s an issue with your web site in web explorer, could check this… IE nonetheless is the market leader and a big component to people will miss your excellent writing due to this problem.